Orthopedic Hand Surgery: When Do You Need Hand Surgery? While these treatments help millions of people overcome pain, limited range of motion and disease, they may not be appropriate for your case, or sometimes they are not enough. Our Jacksonville orthopedic surgeons are each a hand surgery specialist and they practice from the perspective that every patient is unique, and so are their healthcare challenges. For that reason, surgery may or may not be the best option for you. Reach out to our Jacksonville orthopedic unit with questions or to schedule an initial exam. Trauma: Hand surgery following trauma is common. 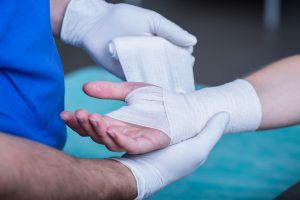 Broken fingers, a broken wrist, crushing injuries, traumatic amputations are all examples of when hand surgery is part of emergency care. Post Trauma Recovery: Sometimes surgery is not possible at the time of trauma and must be part of the follow-up care for recovery. At other times, emergency care needs to be corrected with hand surgery to ensure that long-term use of your hand is as natural as possible. Disease Impacts Use of the Wrist: The primary disease that affects the wrist is arthritis, but other diseases or conditions also require hand surgery. Those may include birth defects, osteoarthritis, rheumatoid arthritis, and infections. Many options exist for treating problems with your wrist. The best advice for people who suffer from hand pain, limited range of motion, or weakness in your hand is to talk with a hand surgery specialist who recognizes that your treatment options and condition require a unique and personalized approach to care and treatment.